Sprinkler Fall winterization, or Blow-out, is done by connecting a high-volume air compressor to your underground irrigation system. The purpose is to void the water in the pipes and heads with air so when freezing temperatures arrive there will not be any water to freeze, expand and cause damage. This service is performed starting around Oct. 1 and runs through Mid-December. Contact Us 913-256-5296 to Schedule your Appointment. It is a simple process that takes an average home anywhere from 15-30 minutes. It could take more depending on the number of zones and size of your system. It is common to need to set an appointment for this service as we will need to be sure the water supply is shut off, and we will need access to the timer, or control box, to be able to cycle the system as the air is supplied. There are exceptions to needing appointments, such as if you have a Hunter Smart Port on the outside of your home and if your water supply shut off is accessible outside as well. Smart Port Pic. Most Hometown Lawn installed systems do not require an appointment for this service. 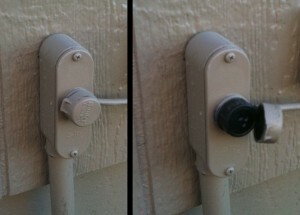 Our installations include a Smart Port and access to the water supply is located by the meter. Here in the Kansas and Missouri metro, there is NO SUCH THING as a permanent “self-draining” system. Our soils here do not support a self draining irrigation system. Self draining systems will work for a few years or more depending on your exact location and soil conditions, but eventually become plugged and no longer allow for water to exit the system by gravity. 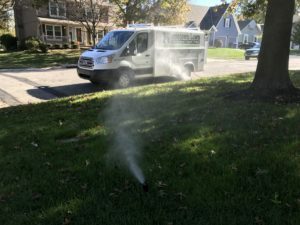 There are many other reasons I can give, from a construction and engineering standpoint if you have some time… Long story short, Hometown Lawn does not install self-draining systems and provides no impression that they will save money or provide for less maintenance over the life of the system.